Teneva-Angelova, Tsvetanka Hristova, Ivelina Pavlov, Atanas and Beshkova, Dora 2018. Advances in Biotechnology for Food Industry. p. 91. Morelli, Lorenzo Callegari, Maria L. and Patrone, Vania 2018. The Bifidobacteria and Related Organisms. p. 271. Shafiei, Yahya 2018. Role of Materials Science in Food Bioengineering. p. 301. Takahashi, Jonathan and Rindfleisch, J. Adam 2018. Integrative Medicine. p. 986. Kochan, Piotr Strus, Magdalena and Heczko, Piotr B. 2018. Diagnostics to Pathogenomics of Sexually Transmitted Infections. p. 41. Ross, Stephanie Maxine 2017. Microbiota in Neuropsychiatry, Part 3. Holistic Nursing Practice, Vol. 31, Issue. 4, p. 270. Ozturkoglu-Budak, Sebnem 2017. Nutrients in Dairy and their Implications on Health and Disease. p. 333. Barbosa, Joana and Teixeira, Paula 2017. Development of probiotic fruit juice powders by spray-drying: A review. Food Reviews International, Vol. 33, Issue. 4, p. 335. Akter Mukta, Julakha Rahman, Mosaddiqur As Sabir, Abdullah Gupta, Dipali Rani Surovy, Musrat Zahan Rahman, Mahfuzur and Islam, M. Tofazzal 2017. Chitosan and plant probiotics application enhance growth and yield of strawberry. Biocatalysis and Agricultural Biotechnology, Vol. 11, Issue. , p. 9. Plaza-Díaz, Julio Ruiz-Ojeda, Francisco Vilchez-Padial, Laura and Gil, Angel 2017. Evidence of the Anti-Inflammatory Effects of Probiotics and Synbiotics in Intestinal Chronic Diseases. Nutrients, Vol. 9, Issue. 6, p. 555. Mohd Redzwan, S. Jamaluddin, Rosita Ahmad, Farah N. and Lim, Ying-Jye 2016. Probiotics, Prebiotics, and Synbiotics. p. 409. Espitia, Paula J.P. Batista, Rejane A. Azeredo, Henriette M.C. and Otoni, Caio G. 2016. Probiotics and their potential applications in active edible films and coatings. Food Research International, Vol. 90, Issue. , p. 42. Shah, Nagendra P. and Champagne, Claude P. 2015. Dairy Processing and Quality Assurance. p. 235. McGuire, Michelle K and McGuire, Mark A 2015. Human Milk: Mother Nature's Prototypical Probiotic Food?. Advances in Nutrition, Vol. 6, Issue. 1, p. 112. Schoeni, Jean L. 2015. Compendium of Methods for the Microbiological Examination of Foods. Mounts, Lauren Sunkara, Rajitha Shackelford, Louis Ogutu, Simon T. Walker, Lloyd and Verghese, Martha 2015. Feeding Soy with Probiotic Attenuates Obesity-Related Metabolic Syndrome Traits in Obese Zucker Rats. Food and Nutrition Sciences, Vol. 06, Issue. 09, p. 780. Ross, Stephanie Maxine 2014. Psychobiotics. Holistic Nursing Practice, Vol. 28, Issue. 5, p. 329. Alvarez-Olmos, MI & Oberhelman, RA (2001) Probiotic agents and infectious diseases: a modern perspective on a traditional therapy. Clin Infect Dis 32, 1567–1576. Fujii, A & Cook, ES (1973) Probiotics. Antistaphylococcal and antifibrinolytic activities of omega-guanidine acids and omega-guanidinoacyl-L-histidines. J Med Chem 16, 1409–1411. 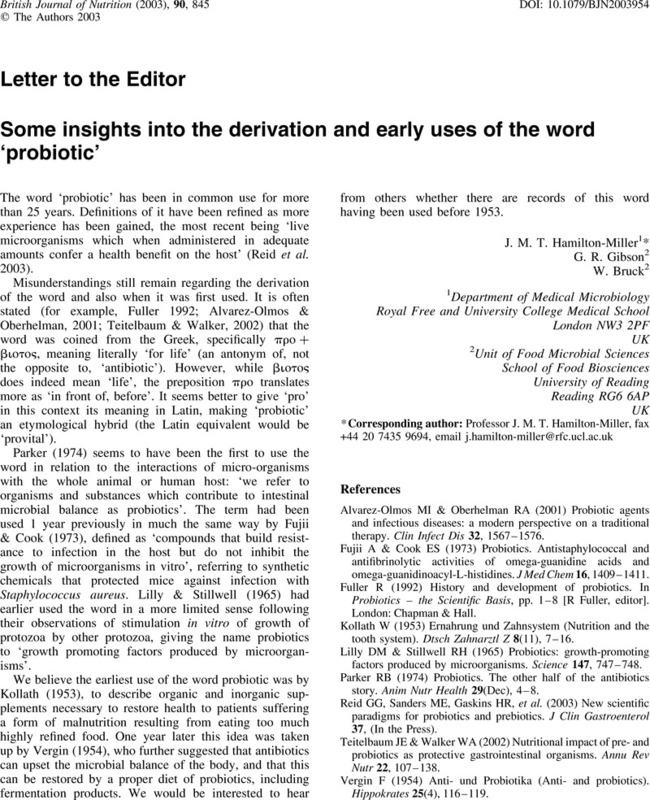 Fuller, R (1992) History and development of probiotics. In Probiotics – the Scientific Basis, pp. 1–8 [R Fuller, editor]. London: Chapman & Hall. Kollath, W (1953) Ernahrung und Zahnsystem (Nutrition and the tooth system). Dtsch Zahnarztl Z 8(11), 7–16. Lilly, DM & Stillwell, RH (1965) Probiotics: growth-promoting factors produced by microorganisms. Science 147, 747–748. Parker, RB (1974) Probiotics. The other half of the antibiotics story. Anim Nutr Health 29(Dec), 4–8. Reid, GG, Sanders, ME, Gaskins, HR, et al. (2003) New scientific paradigms for probiotics and prebiotics. J Clin Gastroenterol 37, (In the Press). Teitelbaum, JE & Walker, WA (2002) Nutritional impact of pre- and probiotics as protective gastrointestinal organisms. Annu Rev Nutr 22, 107–138. Vergin, F (1954) Anti- und Probiotika (Anti- and probiotics). Hippokrates 25(4), 116–119.